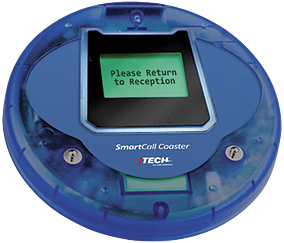 You can count on JTECH QuietCall® and SmartCall™ pagers for the best performance and durability in the industry. Choose a scalable medical paging system that grows with your business needs. From simple button call pagers to a more integrated hospital paging system, our healthcare pagers are flexible and designed to grow with your practice. Maintain a calm and serene atmosphere in your hospital or clinic with our QuietCall® healthcare pagers. Allow your guests to visit the gift store or cafeteria with peace of mind knowing that they won’t miss their appointment. 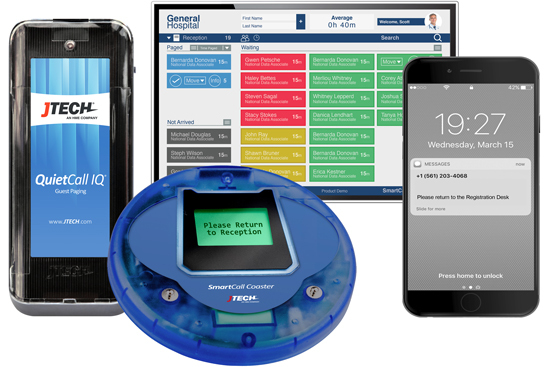 Our QuietCall® healthcare pagers and SmartCall™ hospital paging systems for medical staff and patients are used by physicians, surgical centers, hospital waiting rooms, eyecare centers, dentist offices and veterinary offices. Easy-to-hold pager features tone, vibe or flash and has out-of-range alerts. Fully programmable pager with highly visible LED screen with alpha-numeric messaging. The Commpass pager is a popular option for hospitals, doctor offices and other healthcare clinics. Popular space-saving coaster pager has a stack charger with anti-theft & loss features. This pager features easy-to-ready alpha-numeric messages and out-of-range alerts. Choose between 1 and 3 buttons to quickly call or alert management and staff.